Our Volunteer Puppy Raisers are Indispensable to our Mission! We began raising and training puppies with Volunteer Puppy Raisers in April, 2017. We’re now looking for Puppy Raisers for our February 2018 and September 2018 classes. If you want to give back to your community, join our great cause and immerse yourself in the intellectually stimulating process of converting a lab/shepherd/retriever mix puppy into a Service Dog, the link is below. It’s a win/win – either you’ll have the heartwarming experience of seeing your puppy go to someone truly in need, knowing the dog will change their lives, or, if the puppy doesn’t graduate, you’ll end up with a great dog, if you want to keep it. We will provide the majority of the supplies you’ll need, vet care of the puppies, and supporting classes taught by a CPDT-KA (Certified Professional Dog Trainer), CDBC (Certified Canine Behavior Consultant) and materials to guide you through your time with the puppy. Warning: raising puppies for a Service Dog organization tends to be addictive because it’s rewarding in so many ways! 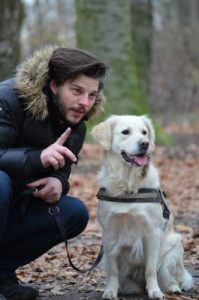 You’ll be supporting a wonderful cause in a very meaningful way, your dogmanship skills will grow, you’ll meet other nice people, and spend time with a great dog! Help 2 less fortunate souls (puppy from a rescue organization and recipient). Because we don’t have our Center yet, we’re asking our puppy raisers, if they can, to continue caring for the puppies at night and weekends once they begin formal training with our Trainer at about 16 months of age. Being a puppy raiser through the dog’s graduation will be a 20 month commitment or so. We also need volunteers to help us at our fundraising events. Out next event is our Day In The Park, Saturday, September 16, 2017, at FDR Park, Yorktown Heights. Interested? Please contact us at info@putnamservicedogs.org. We are now raising funds to buy the site for our Center. We need volunteers to assist us with fundraising events – hosting them or volunteering at our events. Also, if you’re good with the computer, and manipulating databases, PLEASE join our cause.